Imagine that there’s a faucet that’s slowly dripping. If the faucet is left to drip long enough, you’ll notice that it will leave behind deposits from the dissolved minerals in the water. Now, imagine if you left your faucet dripping long enough to create a mineral deposit that was a meter-plus tall. This process is the basic mechanism behind how speleothems form. Speleothems are cave formations built by secondary mineral deposition. The majority of speleothems are composed of calcium carbonate (CaCO3) derived from the limestone or dolostone bedrock that comprise a karst. 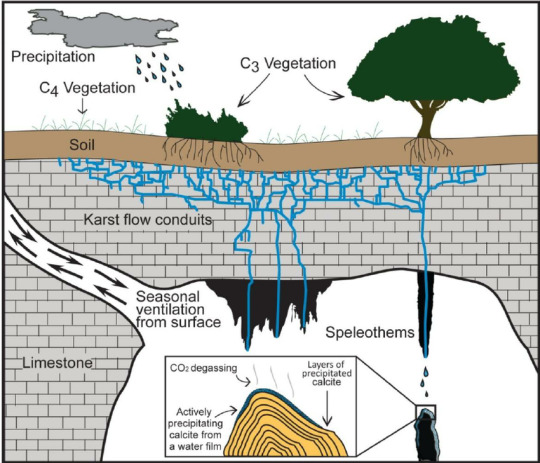 As rainwater interacts with CO2 in the atmosphere and in soils, it becomes weakly acidic. When this water travels down through calcium carbonate bedrock, it reacts with and dissolves the bedrock via carbonate dissolution reactions. When the solution reaches the cave, the lower partial pressure in the cave will cause degassing and drive precipitation of CaCO3, developing speleothems over time. 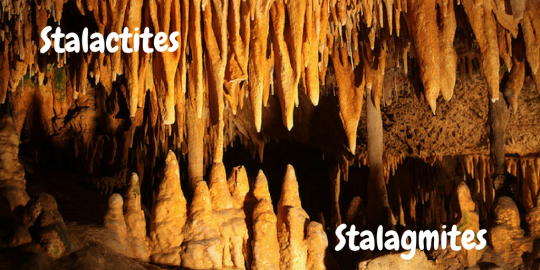 Stalactites and stalagmites both come in various forms, depending on the supply and location of their water source. 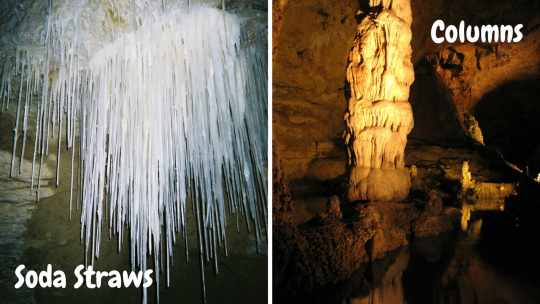 The most delicate type of stalactites are soda straws, which are very long, thin and cylindrical in shape. If a stalactite and a stalagmite grow to reach one another, they will fuse to create a column. Columns reach from the floor to the roof of a cave, making them the most formidable of all speleothems.